Twenty teams took part in this year’s Men’s Elite Open division. There were a lot of surprises this year, as tournament favorites fell round after round after round. Following Saturday’s pool play, the top 12 teams moved onto the Medal Round, while the remaining 8 moved to the Consolation Round. The biggest news in the Consolation was that the 2004 NACBAIT Champion and 2006 Final Four finisher Boston Hurricanes suffered through an 0-3 pool play, and then lost in the first round of the Consolation QF’s to the Philly Suns A. In the Consolation Finals, 6-9 MVP James Chen and 6-7 Carlos Andrade dominated inside, as the Toronto Titans took home the Consolation Chip over the Montreal Kaitas in a battle for Canada. This year’s Medal Round was the most closely contested set of games we have ever seen, as there was no single team who could clearly distinguish themselves from the pack. With the exception of one game in the Medal Round, every single contest went right down to the wire. There were some teams with excellent talent, some teams with great teamwork, some teams that played with unrivaled intensity, and some teams who just got hot at the right time. Any number of teams could have taken this year’s NACBAIT title. In the first round, the 9:00 am 8th-9th game featured NY Maximum Output and the Toronto Dragons. This was a grind it out type matchup, with the halftime score standing at only 16-12, Toronto. Maximum Output dominated inside throughout the second half, as Toronto Top 25 selection Denny Lee was just outnumbered against the slew of NY tough big men. But young pg Jordan Chiang (18 points) kept the Dragons in the game, with a mix of drives and treys. With time winding down and Toronto holding a 30-28 lead, Jordan rattled in a 3-pointer to give the Dragons a 5 point lead. MO answered with a deuce, and Toronto was sent to the line. Toronto failed to convert, and NY had one last gasp at OT. All-tournament selection Eddie Wang (12 pts) missed a long range bomb and Toronto advanced 33-30. Up next was the highly anticipated duel between the high powered offense of the undefeated #5 Arizona Desert Jade and the all around game of #12 Texas Ballistics, who barely squeaked into the playoffs on point differentials. But once the game begins, seedings don’t matter as much as who can drop buckets in the rim. Texas was in control of the game as their balanced attack gave them a 27-23 halftime lead. Meanwhile, Arizona got only 3 players into the scoring column for the entire game, with Bennett Woodward (14 pts, 2-3 ft’s), David Clarke (20 pts, 2 treys, 6-6 ft), and Stephen Chang (22 pts, 2-2 fts) doing all their damage. The Ballistics stretched the lead to double digits and they were in the driver’s seat. But Arizona used everything they had left in their tank as they kept pushing the tempo and managed to get back within 2. The momentum began to shift, and SF David Clarke went off. He scored 8 straight points- on 2 pullup treys and 2 ft’s. Norman Wang answered with a power move inside, and Scott Wang popped a treyball for Texas. But Bennett Woodward swished 2 free throws down the stretch and Arizona pulled off an amazing comeback 56-53. The next game was a physically grueling showdown between NY USAB and the NY Rockits AIA. The Rockits controlled the first half, despite an injury to All-Tournament PF Kevin Chin (12 points). Unfortunately, Kevin was injured as a USAB player (intentionally or unintentionally, based on your POV) kicked him in the chest as he was lying on the ground during a controversial play. But Rockits swingman Chris Chin (19 pts, 3 treys, 3 steals) kept his composure and responded by playing a great game on both ends of the floor for the Rockits. In the second half, the game started to go USAB’s way. NACBA Top 25 center Kevin Low got into serious foul trouble and 6-4 Joe Vines started to dominate inside against the smaller Rockits lineup. Underrated pg Zachary Liu (12 pts, 2 trifectas, 5-7 fg, All-Tournament) balanced out the attack for USAB to make the Rockits pay whenever they tried to collapse inside. USAB seized a 52-44 lead after Harry Wang scored a tough bucket inside. Kenny Yu answered with a three-pointer and Chris Chin got a steal and a layup (but missed on the 3-point play opportunity) to get the Rockits within 3. After that, the last 40 seconds turned into a free throw contest and USAB marched on 57-51. The last game of the round was the only true blowout of the day as SF Duke crushed their neighborhood rival Cali Davis Dynasty. Dynasty was missing 2 of their tallest and most talented ballers this weekend, but the Duke showed no mercy and took complete advantage of the situation. SF sped out early to a 15 point lead and never looked back. The only guys keeping the score semi-respectable for the shorthanded Dynasty were Pittsburgh Panda free agents Joe Tang (19 pts, 6 rebs) and Yitao Sun (11 pts). Conlan Kwong and Ryan Dunn led the Duke with 11 and 10 points each. We even caught a glimpse of NACBA Top 25 legend Sam Lee as he popped in a jumper towards the end run of the game. SF Duke 67, Cali Davis Dynasty 41. Once the QF round began, the stakes were even higher and the games stayed intense. The refs in this round were really making teams earn the W’s, and it was generally the physically tougher teams who advanced to the Semis. The first game was the #8 Toronto Dragons and #1 NY Cruisers. The inspired Cruisers were looking to make their first ever Final Four, while the Toronto Dragons have made the Final Four twice since 2003. NY started out large and in charge, with Tony Hu (13 pts) and George Chan (10 pts, 2-2 ft’s) dominating the paint. The Cruisers held a 22-12 halftime lead and given the snail’s pace of the game, the 10 point lead seemed insurmountable. But Toronto kept chipping away. Jordan Chiang attacked the rack and made the zebras blow the whistle, as he shot 7-10 from the line in the second half to get his team back in contention. The Dragons got to within 3 in the last minute, as the Cruisers missed a plethora of free throws (3-8 in the second half). But time ran out on the Toronto comeback, as the Cruisers made plans for their first ever Monday appearance with a 34-31 triumph. The next game of the Quarterfinals was NY USAB and Arizona Desert Jade. The game was neck and neck up until Arizona was called for a technical foul as they failed to register all of their players in the scorebook. After that, Desert Jade collapsed. They slipped into a hole, just as they did against Texas. But it was clear that they had no legs left after their furious comeback run in the previous game. Again, Arizona relied on the same 3 players to score their points (David Clarke 17 pts, Bennett Woodward 14 pts, Stephen Chang 19 pts, and one other player scored a 3-pointer). USAB’s young legs kept running, and Desert Jade couldn’t keep up in transition. Arizona couldn’t slide their feet anymore on defense and could only slap at the ball, but NY sank 16-20 from the line. NY advanced 63-52. In the next game, Washington CYC came in ultra confident as they faced USAB. CYC had crushed USAB in pool play after USAB lost their tempers and received technical fouls for throwing elbows and complaining at the referees. CYC wanted to run USAB off the floor, but USAB rose to the challenge this time around. USAB played excellent man to man defense and didn’t let CYC’s shooters get good looks. CYC kept forcing the uptempo game but NY was getting back on defense each time. DC kept taking rushed shots and deep jumpers that were missing their mark. Early on for USAB, Jason Chin was swishing jays and Zachary Liu (12 pts, 6 assists) was directing the offense well. USAB had complete rule of the game 26-18 midway through. But in the second half, CYC became more patient and efficient on offense. Washington stopped running crazy and moved the ball around for open shots as Jeffrey Lee’s play (15 pts, 6-6 fts, 8 assists, All-NACBAIT) was the key. After back to back triples by Kwan Huynh and Bobby Hsieh, Washington took a 1 point lead. A couple possessions later, USAB was down by 2 and dug in for a key defensive stop. They stole the ball with a minute to play, and threw it ahead to 6-4 Joe Vines. Joe made the biggest bonehead move of the tournament as he tried to throw it down instead of taking the freebie layup. The ball bounced off the back rim and CYC’s Jeffrey Lee gathered in the rebound. USAB was still in the game but mysteriously tackled Jeff as USAB was called for the flagrant foul. Jeffrey sank 2-2, CYC got the ball back on the flagrant foul, and Bobby Hsieh (All-Tournament, 11 pts, 4-4 ft) then swished 2 more to give CYC their 6 point margin of victory 45-39. The final game of the round was a hugely anticipated rematch between the SF Duke (runners up in 2005, 2006) and the #2 seeded Chicago Dragons. Chicago had defeated SF 53-47 in pool play, so the Duke was looking for some revenge. San Fran was the consensus pick to win it all this year, so most everyone expected them to step it up a notch and get past Chicago. But the proud Chicago Dragons would have none of that. They shot an amazing percentage throughout the game, and played a gritty, physical style that the lanky, athletic SF players could not overcome. The Dragons seized an early lead and never looked back. With SF trailing, they were forced to foul early and often. But this was Chicago’s day as they nailed an astonishing 20-21 freebies for a 48-43 win. Damean Clinton (17 pts, 6-6 ft’s) and Andrew Tsai (13 pts, 4-4 ft’s, 3 triples) led Chicago, while Conlan Kwong (11 pts, 3 treys) and Henry Hong (11 pts, 7 boards) paced Frisco. Monday’s first Semifinal pitted the NY Cruisers and NY USAB. USAB knew they had to run the court if they wanted to beat the superbly efficient Cruisers, so they ran as if their lives depended on it. They also refused to allow All-Tournament PF Tony Hu to get any good looks, as they fouled him each time he got the rock underneath. Tony had no first half field goals, as they sent him to the line 8 times. At the half, USAB led 30-24 and was playing well. The game got close in the second half until both CB Liu and George Chan fouled out for the Cruisers. After that, USAB stamped a ticket to the Finals 54-48. The Cruisers were led by Tony Hu’s monstrous 19 pts, while Cali imported free agents Sam Luong (16 pts) and Mitchell Fong (12 pts) were the top guys for USAB. The other Semi was one of the top games of the Tournament as Washington CYC squared off with the Chicago Dragons in the #2/#3 match. Of the 4 teams remaining, most people had put their money on CYC to take it all, but the games are always played for a reason. Chicago came out with a hardnosed man defense on Washington, while Washington countered with their own ball pressuring man to man D. Both teams were hitting some tough shots against good defense and Chicago hit a big shot at the end of the half to pull them within a trey, 22-19 midway through. CYC was still upbeat but they knew they could have been up by more if they didn’t miss an uncharacteristic 5 free throws in the first half. In the second half, Chicago’s Joe Carlini (13 pts, 6-6 ft) and Andrew Tsai (11 pts, 1 steal) got the Dragons thinking that they should go to the Finals and CYC started to turn the ball over. Chicago was playing well, and the outside shots were not going in for DC. The Chicago Dragons held a 9 point lead with 9 minutes to go. CYC crept back in, as they hustled for all the loose balls, Keith Wang hit some big shots, and Jason Lee stepped it up inside as he scored 5 straight. Late in the game, Andrew Tsai was injured as he rolled his ankle and then lost the ball out of bounds as he was writhing in pain. CYC got the ball with 40 ticks remaining. Washington did not call timeout, and opted to freelance until they got a good shot. Jeffrey Lee had it up top, swung the ball to Bobby Hsieh on the right wing, who then looked inside to Jason Lee with 20 seconds to go. Jason turned and his defender backed off so he was forced to take the uncontested midrange. It rimmed out, and Chicago got the ball. They dribbled the ball upcourt and held the ball for one final shot. They got the ball into the hands of superstar Joe Carlini. Joe was on the right wing and dribbled left towards the top of the key, all the while being shadowed by CYC’s Keith Wang. With 1 tick to go, Joe took one lunge left, faded away and let it fly as his body was at an impossible angle to the ground. The buzzer sounded, and then the ball dropped through the hoop. Chicago celebrated as DC stood in disbelief. Chicago advanced 43-41 in ultra dramatic fashion. 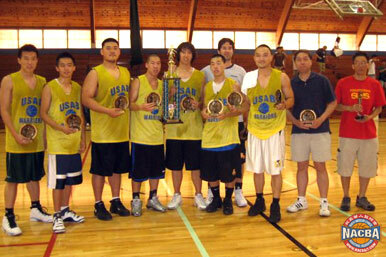 In the Finals, Chicago was wondering if their injured star shooter Andrew Tsai would be able to play. In the first half, Andrew (13 points, 3 triples) was able overcome his now grapefruit sized ankle as Chicago took an 8 point lead towards the end of the first 20 minutes. Meanwhile, guard Nick Mui was keeping NY in the game with 8 first half points. At halftime, Chicago was winning 23-18, but the NYC deficit seemed to be much larger than that. In the second half, All-NACBAIT selection Andrew Tsai was unable to play at his usual level due to his sprain. Chicago had to make some changes in their backcourt, and that resulted in a couple of senseless turnovers. The lead shrank to only four points at 34-30 with 6 minutes to play. USAB kept it close and even tied the game with 2 and change to go. Unsung hero Patrick Chin then found James Woo underneath for an easy layup and the score was 38-36 Chicago. USAB then missed a jumper, but the Dragons gave the ball right back with an illegal screen with 1:32 on the clock. Sam Luong drive baseline for a skying reverse layin and the score was tied. USAB got the ball back with 30 seconds to go, and then dribbled away some clock. Their floppy haired big man got fouled and hit 1 of 2 free throws with 11 seconds. Chicago had one last chance, but USAB fouled them and then Chicago threw the ball away in the corner. USAB won 39-38. MVP was Sam Luong.